Warning: spoilers are ahead for Ant-Man! If you haven’t seen the movie yet, turn back and click on another one of our articles. After May’s intense and continuity-heavy Avengers: Age of Ultron, Marvel provided a smaller adventure (figuratively and literally) for moviegoers over the weekend with Ant-Man. Still, as with any Marvel project, there were plenty of ties to the rest of the MCU, from Scott Lang’s fight with Falcon to a quick Spider-Man reference. While Easter Eggs and cameos are fun to see, the film also found time to expand on the universe…literally. In the midst of the shrinking shenanigans, the superhero heist film introduced audiences to a new world: the Quantum Realm. In Ant-Man, Hank Pym describes the Quantum Realm as an alternate dimension that can be accessed if someone shrinks down to a small enough size. Once in this dimension, time and space become irrelevant. This may sound cool at first, but as it turns out, it’s not as easy to get out as it is to get in. Hank’s wife Janet, a.k.a. 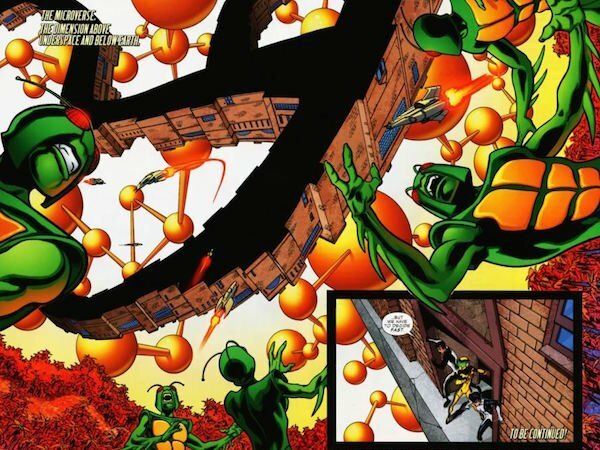 The Wasp, disappeared into this dimension in 1987 when she shrunk down to disable a Soviet missile. Scott was transported to the Quantum Realm when he sabotaged Darren Cross’ Yellowjacket armor and it shrank uncontrollably. As Scott became smaller and smaller (bonus points if you spotted that tardigrade), he found himself in a bizarre reality that looked…well, if you’ve seen Interstellar, it looked similar to that: a realm filled with energy waves and infinite reflections of the person trapped. Scott was able to escape this dimension by activating one of Hank’s enlargement discs, and while he couldn’t remember anything of his time there, the fact that he survived gave Hank hope that maybe his wife can somehow be retrieved from her exile. The Quantum Realm is known as the Microverse in the Marvel comics universe, but the two function in largely the same way. Once an individual shrinks to a small enough size, they are shoved through a nexus that transports them into the dimension. In other words, the Microverse itself isn’t tiny, but the gateways to enter it are. This dimension was created by time traveller Prince Wayfinder, who came from an alternate future where humanity had been forced to leave Earth and spread across the galaxy. After his people, the Ithacons, survived a war with the savage Haaman, Wayfinder used the Sword in the Star to transport himself and the Ithacons 65 million years into the past. Once there, the Sword shrank these denizens beyond subatomic size and created the Microverse, their new home. In the modern day, many of the Marvel heroes have adventured in the Microverse, and this unusual world had its own team of superheroes at one point called The Micronauts. When Will See See The Quantum Realm Again? While the intricacies of the MCU’s Quantum Realm were left unexplored in Ant-Man, we may learn more about this mysterious realm sooner than expected. Doctor Strange hits theaters in November 2016, and its plot synopsis mentioned that the eponymous character will not just discover magic, but alternate dimensions as well. Marvel Studios president Kevin Feige has since said that the meaninglessness of time and space in the Quantum Realm comes into play for Doctor Strange, where presumably there are similar rules in play in the worlds the good Doctor will visit. This doesn’t necessarily mean we’ll get a direct crossover between Doctor Strange and Ant-Man, but don’t be surprised if the Quantum Realm happens to one of the alternate dimensions that Strange explores during his solo adventure. Plus, if there’s even the slightest chance that Janet can be rescued, the Sorcerer Supreme might be the one would be able to find her. Something tells me we could also see the Quantum Realm and these other worlds somehow appear in the Avengers: Infinity War movies, especially with the Infinity Stones at work. Although fans will see Scott Lang again next year in Captain America: Civil War, it’s unclear if/when we’ll get Ant-Man 2. Regardless, the film left a unique mark on the MCU by introducing the Quantum Realm. While it has its differences from the comic universe’s Microverse (namely by being more abstract), Feige has also said that the Quantum Realm and these other places that are "mind-bendingly hard to fathom" will play into Phase Three. So while Avengers: Age of Ultron sets the stage for the new status quo for the Earth heroes, Ant-Man literally opened up a new universe to be explored in the future.